Gallery - Forest of Boland - Cookhouse and stream. Chumma-Chum-Chum crosses the viaduct with the evening train. indentAt the station throat is this rickety log bridge across a lively "Beck". Just like the real thing the logs are "lashed" together in true Boy Scout fashion. Difficult to see from this angle is the bow in the main timbers which make this the only hump-backed railway bridge I've ever seen! indentBehind, almost lost in shadow, is the new Kitchen building provided to store and cook the miner's lunches. 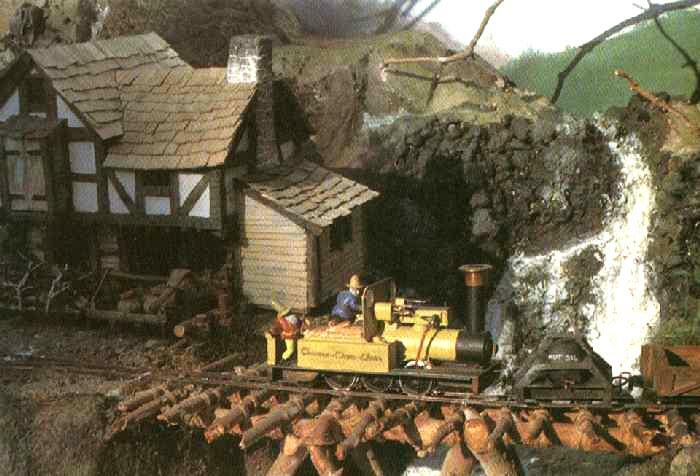 (It looks rather like a goods shed but has a chimney!) Wagons await unloading outside. The Loco Siding seen in other pictures is just out of the picture to the right.